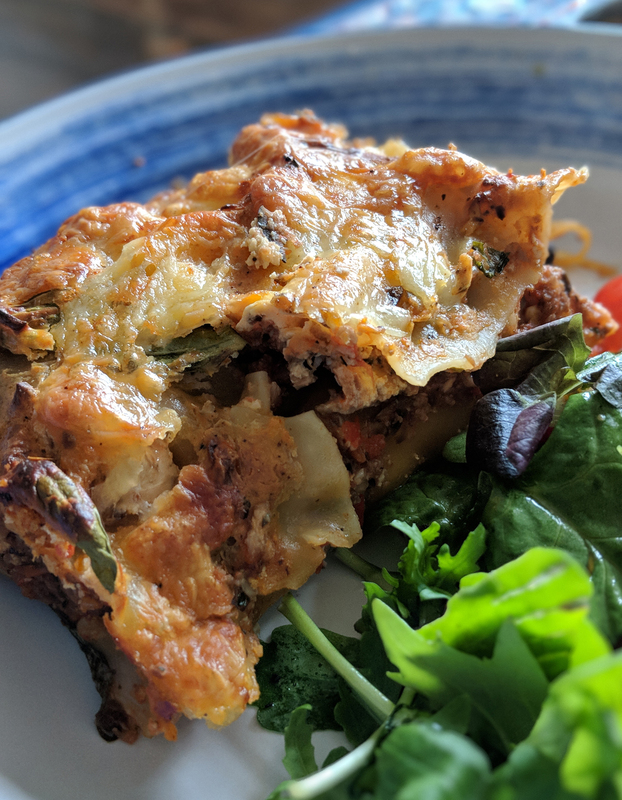 Although I’ve previously posted a vegetarian lasagne recipe, I couldn’t resist sharing this one, as it’s very different to the first, but equally as delicious. 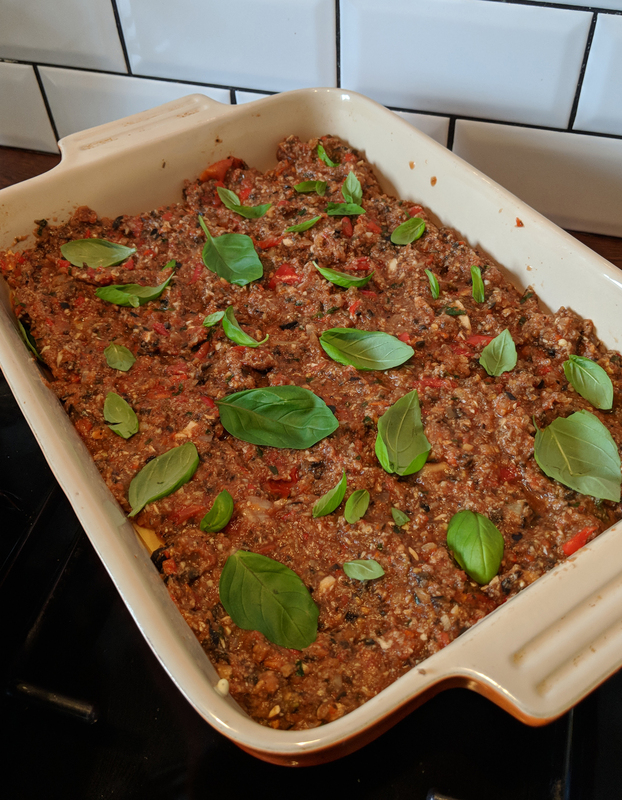 I first found inspiration for this recipe because we had two tubs of mushrooms that desperately needed using up, so I first searched for a mushrooms lasagne recipe, and then came across one that included olive tapenade. 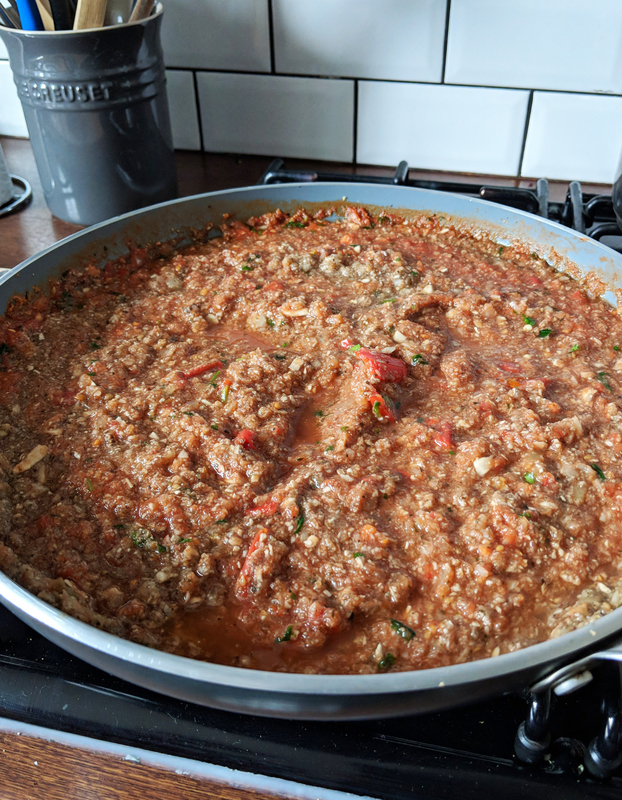 Although we had no tapenade, we did have a jar of olives, so I got my creative hat on and made a mushroom and olive ‘meat’ layer, in a rich tomato sauce. 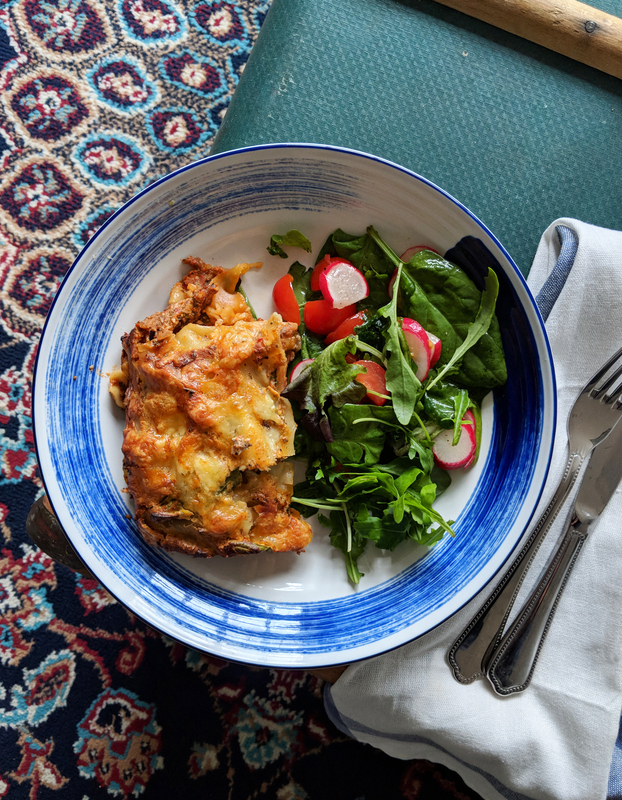 The Bechamel layer is something we fall back on time and time again. 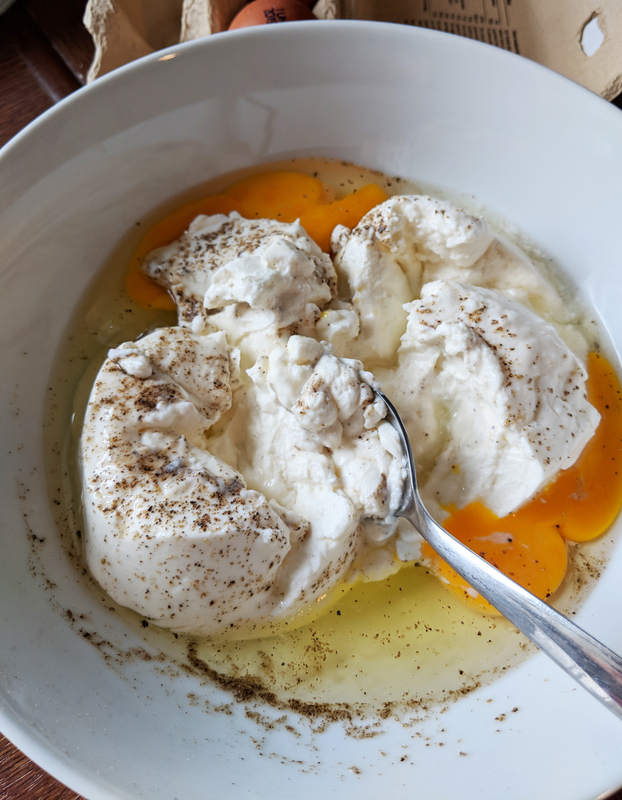 It’s simply just ricotta, egg and salt and pepper, but it works! Super easy and really creamy. 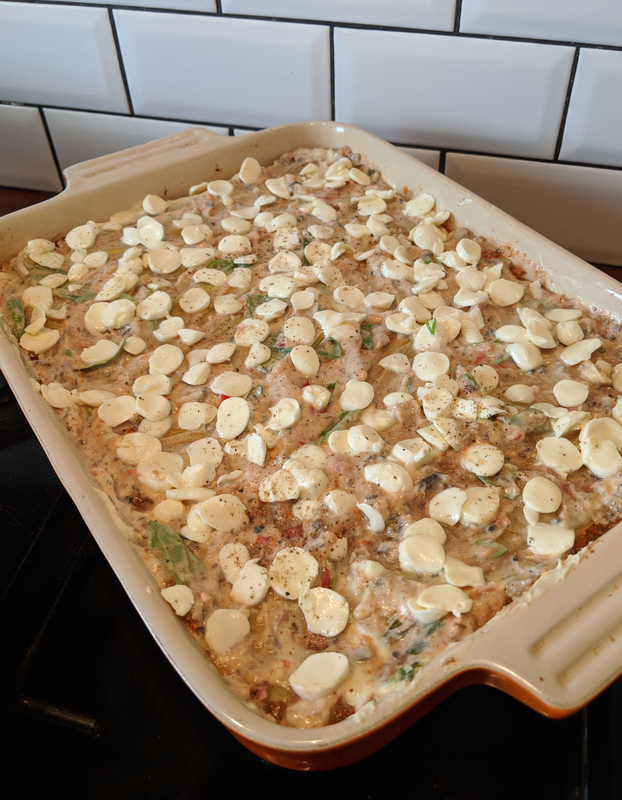 Not a traditional Bechamel, but so much easier to make. 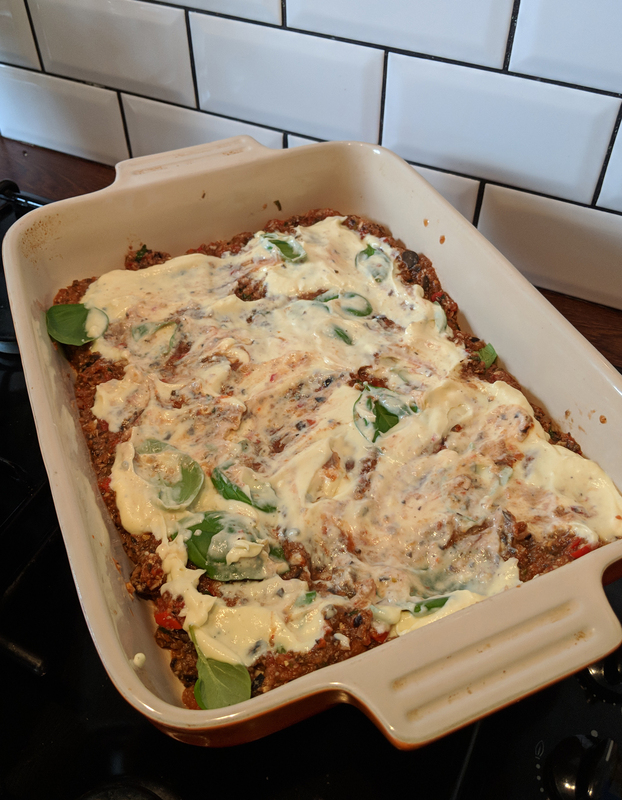 I’ve listed the ingredients in order of how we used them, to make the recipe easier to follow. There are a few elements, but everything comes together in the layering. Begin by pre-heating the oven to 180 degrees. Add a drop of oil to a deep frying pan on a medium heat. Brown the onion, before adding the garlic and chilli. Add the cherry tomatoes, tin of chopped tomatoes, chopped mushrooms, dried parsley and dried basil. Turn the heat to low and simmer for 10 minutes. 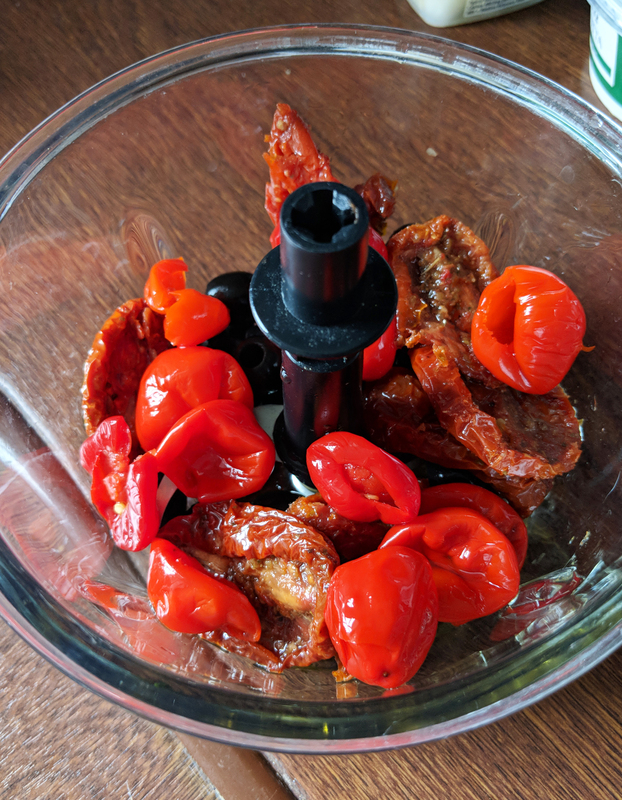 Meanwhile in a food processer, dice the black olives, sundried tomatoes and pappadew peppers together. Add this to the frying pan with and combine well. Continue to simmer for another 5 minutes until thickened slightly. Add the ricotta and egg to a bowl and whisk to combine. Season with salt and black pepper. This is your white sauce layer. Remove your mushroom sauce from the heat. 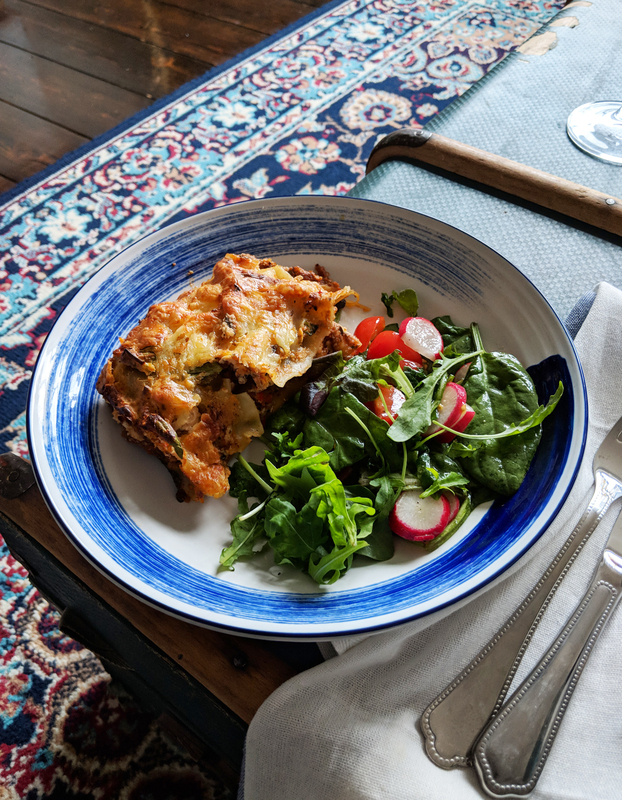 Begin building your lasagne in a deep roasting dish by adding one layer of pasta sheets to the bottom of the dish. Top with a third of the mushroom sauce, sprinkle some fresh basil leaves over top and then add a third of your white sauce. Use the back of the spoon to spread out. This may get slightly messy, with layers combining, but it will taste great! 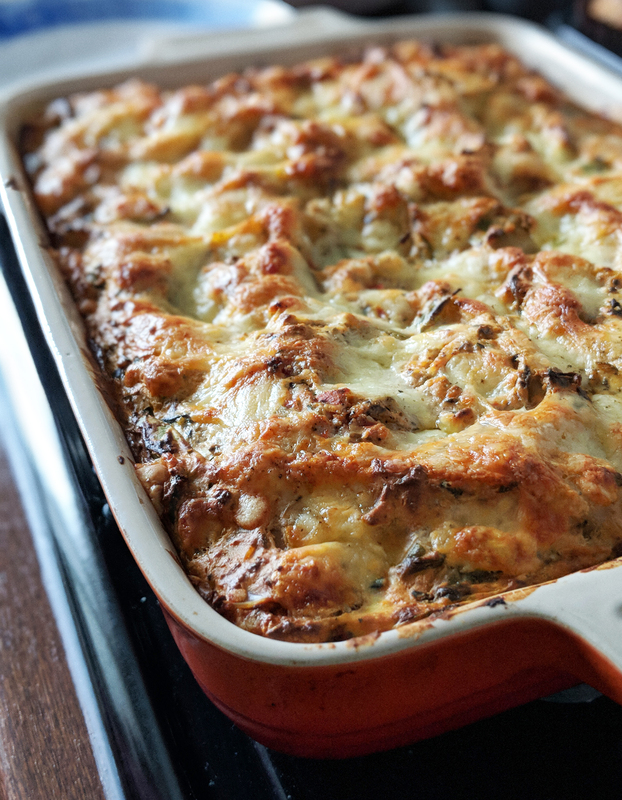 Do the same for one more layer – pasta, mushroom sauce, basil, white sauce. Add a third layer of pasta, followed by the mushroom sauce and fresh basil. Add another layer of pasta to finish, and then top with the remaining third of the white sauce. Sprinkle over the sliced mozzarella and bake for 25 minutes in the oven.